Hey, need a cool job for the summertime? Well, turns out the Syracuse (Sky) Chiefs need a new body to cram into their mascot costume! Lovely! 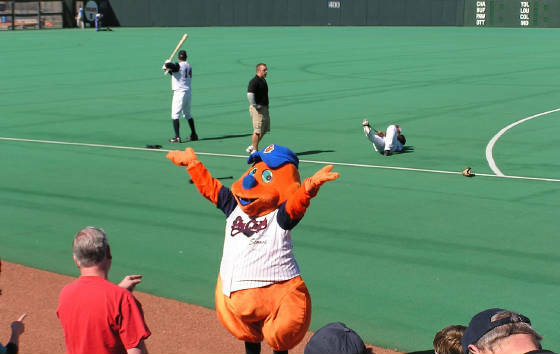 The mascot's name is Scooch. Open auditions are being held March 10th between 11 and 2. You can't be too tall... between 5'2" and 5'9". NO PRIOR MASCOT EXPERIENCE NECESSARY!!! I would love to go see what a mascot audition entails... "Okay, put your mitts up to your mouth like you're giggling coyly...hold your head up high and wave... WAVE!! Now, throw these squishy balls to the upper deck..."